I arrived in the centre of Kompong Thom just before 10am, having started early that day at 5.30am, to eat breakfast, say my goodbyes to the family and staff at the Shadow of Angkor guesthouse and to Rieng, who stopped by to wish me well. The Mekong Express bus left the Siem Reap coach station at 7.40am and took just over two hours to deposit me in front of the Arunras Hotel, and to the beaming smile of my great friend Sokhom. 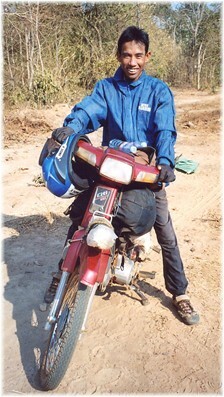 Within an hour we'd left my backpack with Sokhom's wife and were on his trusty Daelim moto, for the 130 kms trip due north to Tbeng Meanchey (TBM), on the hunt for new adventures. It was an uneventful trek, though we stopped enroute for drinks at the village of Svay Phay where Kanya, the vendor, had a real thirst for learning English and didn't want us to leave. Our journey took us seven hours, as we reached TBM at 3.30pm and called into the Malop Dong restaurant for a bowl of chicken soup and a breather from the hot sun. Our next destination was the village of Koulean, east of TBM and a ninety-minute ride away. We arrived just before 6pm, booked the last two fan rooms (for $2.50 each) at the Chey Chom Neas guesthouse and enjoyed a cold water shower, just what the doctor ordered after our hard day on the road. Hungry, we went in search of a food stall and found only one still open. Everywhere else had closed down as most of the village were attending a wedding, hence the loud music that enveloped the village, but our hosts had not been invited. Plates of chicken, vegetables and rice, washed down with drinks, came to just $2. Back at the guesthouse, I spied a group of twenty children watching a horror film on the television, so I crept up on them and jumped into the room to provide a double fright, from both the tension of the film and me - being the only foreigner they'd ever met. After recovering from the fright, everyone fell about giggling and laughing and I sat down with them to watch an unintelligible dvd dubbed into Khmer from Korean. I retired to my room at 9pm but the loud music from the wedding interrupted my attempts to sleep until it finished at 2.30am. From 5am the cacophony of sounds from animals, birds, kids, cooking pots, et al signalled another early start for us, so we paid the bill and returned to our food stall, now very busy with customers, for some breakfast noddles and a boxed lunch. Our target was a series of ancient Angkorean temples I'd identified in the Preah Vihear countryside, as we set off at 7.30am, taking a northeast route, and heading for the village of Prey Veng. It was an hour before we had our next human contact - a family in an ox-cart - with the track through scrub and fields barely identifiable until we arrived at the Stung Rongea river crossing, amidst a massive bamboo forest. Most of the rice fields had been burned so my trousers were covered in soot marks and for the next hour we saw only three policemen on bikes, before we arrived at our first destination, Prey Veng village. Whilst a group of men played volleyball, a village meeting was taking place and it looked like most of the 300 inhabitants were present. Our objective was a nearby temple, Prasat Chean Sram and Tel offered to guide us, once the volleyball game had finished! At 10am, Tel led us by bicycle along a forest trail for 2 kms, to a large bamboo thicket and announced we'd arrived - I couldn't see a thing but I knew appearances can be deceptive. Just past the first line of trees was a laterite wall surrounding a deep pond and immediately beyond that was another larger laterite wall and a beautiful sandstone entrance gopura, with a lintel of Indra, a Gala pediment, colonettes and balustered windows. Tel told us that the temple had been demined a year before and had taken three months to clear. Immediately inside the gateway were two ruined laterite libraries with lintels and a collapsed gallery along the outer wall. In front of us, on a six-foot high sandstone platform, was the temple's centrepiece quincrux of five brick towers in varying degrees of ruin and surrounded by vegetation. Each tower was open to the east, had a lintel or two in situ, with nicely carved versions of Indra, Nandin, Gala and a small sanskrit inscription on one of the doorways. Beyond the central platform was the second gopura, the west gate, with lintels intact too. It was certainly the best example of a tenth century temple I'd seen for a while on my travels outside of Angkor. Left: Tel & the author. Right: Prasat Chean Sram. I asked Tel about another site, Phnom Sandak, which he pointed to in the distance, approximately ten kilometres away and said he'd visited the three temples there - Prasats Kay, Konchen and Ter - but assured me all three were very badly ruined. I believed him. It was midday so we moved to the nearby baray to eat our lunch amongst the birds and butterflies in a beautifully peaceful spot. Tel shared our chicken and rice and told us about his ten years as a Khmer Rouge foot soldier, joining them when he was just thirteen. Now 4o years old, he makes a little money from selling resin oil from gum trees but life in the countryside is a perpetual struggle. 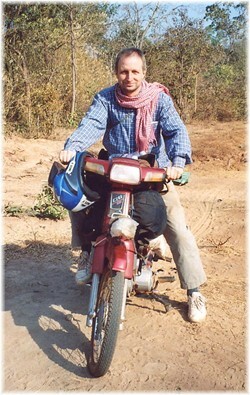 We thanked Tel and rode off heading for Yeang village, where I believed there were two more temple sites to discover. Our route was an ox-cart track, across half a dozen dried riverbeds and most likely impossible during the rainy season. The 10 kms to the village of Choam Sre took us an hour and our arrival aroused great interest. A large village of 150 families, we stopped for drinks, petrol and a game of volleyball. It was another ten kilometres to Yeang village and despite a detour over and around the Stung Sen river, we arrived forty-five minutes later, at 3pm. Yeang is a typical countryside village, neatly arranged in a grid-like fashion and full of friendly, smiling faces. We stopped for a Red Bull at a drinks stall manned by Sinourt and asked where we could stay overnight. She said, "follow me." I looked like the Pied Piper as I headed a line of small inquisitive children, who followed us to Sinourt's parent's house. To say we were made welcome is a massive understatement. Phearng and Sinoun, her parents, were effervescent in their greeting and Sinoun promptly selected her fattest chicken, broke its neck and preceded to pluck and cook it, while Phearng and a couple of his friends shared bottles of rice wine with Sokhom and myself. We climbed the steps of the family home to eat our chicken supper and were joined by our hosts' five children - Jana (20), Golap (16), Bonty (12), Vila (8) and then Sinourt (24), arrived with her two children, Sonida (7) and Sokthea (4). Phearng and Sinoun were wonderful hosts, as we spent the next four hours talking about our respective lives, interspersed with much laughter and compliments. Phearng, who was born in the village, told us there were 77 families living there and most were at one time or another allied to the Khmer Rouge. He himself spent a dozen years as a guerrilla soldier, calling that period of his life, "a nightmare". Despite my protestations, they gave me a mattress, blanket and mosquito net and we all retired around 9.30pm, after of course, a photo session that seemed to last for an hour at least! Left to right: Sinoun, Phearng, me, Jana. Even with a blanket, it was a cold night as I woke up intermittently before getting up at 6.30am to the usual village noises. The daughters cooked our breakfast of dried fish and omelette with rice and I took a freezing cold shower with water from their own well. Another photo session preceded our 9am departure - as most of the village came around to take a look at the stranger in their midst. Phearng told me no foreigner had ever stayed in the village before, and it was an emotional goodbye to Sinoun and her children - our bond had grown quickly and I promised to see them on my next visit to the province, as well as bringing them the album of photos I'd taken! Jana was getting married in a month and told me my visit was a good omen for her wedding - I was very touched and it was a wrench to leave. It is people like Phearng and his family that leave such a lasting impression on me - they have so little and their life is a real struggle, but they're willing to share whatever they have with Sokhom and myself, who are complete strangers. Leaving Yeang village with Phearng as our guide, we headed north, wading through the Stung Sen river, on the hunt for two more temple sites, Prasat Dap and Prasat Bei, and stopping at the village of Komping to collect Phearng's cousin, Norn, and a long knife. Another 8 kms due north, across five dried riverbeds, a bamboo forest that we had to cut our way through and a major mechanical problem with Phearng's moto, we reached Prasat Dap at 11am. With an outer laterite wall, the large central brick tower was still standing but without its roof, while at least four other brick towers were in ruins, as were two laterite libraries. The site was awash with thick vegetation, piles of bricks, broken colonettes, a pedestal but no lintels, and Norn told us all carvings had been stolen by thieves. For the next two hours, we spent most of the time making little headway due to Phearng's starter-motor problem, so in the end he decided to head home on foot and leave Sokhom, Norn and myself to carry onto Prasat Bei. Another emotional parting ensued. 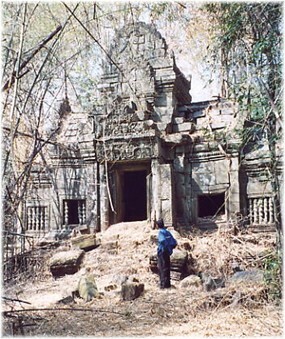 At 2pm we arrived at the temple - three towers, comprising large sandstone blocks but without any decorative carvings. A few colonettes and a large pedestal in one tower were all that remained, and a sandstone library and the east gopura and wall were in a particularly ruinous state. All vegetation had been burned off and my trousers were again covered in soot - I must remember to wear some darker trousers next time. The temple wasn't what I'd hoped for but its all about the experience. Norn was just 2 kms from Komping village so he pointed us in the direction of Choam Khsan, our next destination and walked off into the forest. Half an hour later, tracing a track through the forest, and keeping our fingers crossed, we met the main TBM to Preah Vihear road. Just before 4pm we crossed the eleven iron bridges that announce you've entered the large settlement of Choam Khsan. With our regular guesthouse at Heng Heng by the market, now closed, we chose the Serypeap GH and a more than welcome cold shower. Just before 6pm we drove around looking for a food stall and found just one still open, in the market area, where we gulped down our chicken soup and moved next door for some refreshing tikalok fruit drinks. We were joined for a chat by Soveat, the former owner of the Heng Heng which he's now converted to an all-purpose store. With most of Choam Khsan already asleep, we retired to our rooms by 8.30pm for an early night, ready for a return to Prasat Khna bright and early the next morning - a temple we'd visited a year earlier and where the wonderful Toun Sokheng resided. 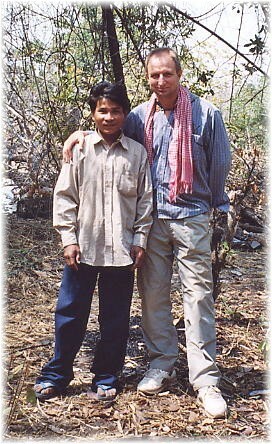 [Left] Author and [right] Sokhom, take a break from the rigours of Preah Vihear's back roads to pose for the camera!